Mumbai, 30th January 2019: The “(Un)folding” Gaurav Gupta’s sensational show at The Royal Opera House was a memorable opening for Lakmé Fashion Week Summer/Resort 2019. A Gaurav Gupta show not only has fantabulous creations that boggle the mind but there is drama, dance and spectacular visual effects. As the curtain slid apart, the stage was draped in folds of white fabrics from which a statuesque beauty rose up to the ceiling, while her voluminous white gown covered the stage. The curved spiral staircase was a grand setting from where the models glided down to the ramp. The show presented with the recitation of a monologue and interspersed with balletic dancers, opened with the gorgeous Bollywood star Tabu in a dazzling grey gown that glittered under the ramp lights. Merging embellishments and textiles in an innovative manner, Gaurav brought his expertise with origami folding and fluid structural construction for silhouettes that will be coveted by the global Indian millennials. Introducing Lucknowi Chikankari for draped demi-couture dresses along with a vibrant yellow, known traditionally as ‘Basanti’, Gaurav included sun-kissed Banarasi brocades for deconstructed lehengas. The show divided into colours, started with pale blue then moved to midnight black, then fiery rose, soothing ivory and then to gorgeous brocade. The final unbelievably constructed vibrant yellow, wired, curved and moulded will-power gown was an arresting study in construction and grandeur that only Gaurav can visualise. A mélange of dresses, pantsuits, sari gowns and eveningwear classics were dappled with zardosi, Chikankari and hand-woven brocades. The embroidery was specially crafted as 3D flowers in delicate organza and soft georgette, blossomed all over the garments along with a discreet splash of crystals. The construction was extreme with a scaffold-like inspiration; while the colour card kept the Chikankari craft in mind and therefore stayed true to timeless pastels like yellow, ivory, rose and powder blue. The tucked, draped and folded skirts, asymmetric mini, embroidered yokes and sleeves for slinky gowns, the neo sari with a beaded bustier and the sensational sari gowns were breath taking. The swirling cape over a pant suit and a pair of black and red identical gowns kept the show in a high voltage state. Sleeves soared upward from shoulders, while sharply tailored jackets were worn with draped trousers. The Indian bridal wear was given the Gaurav Gupta touch as heavily embellished skirts with 3D appliqués were worn with intricately draped blouses. At times, a discreet transparency appeared for the creations to add a hint of mystery. Menswear followed in a similar fashion. Glittering black tuxedos, some with shimmering lapels, zippered tailcoats, a red biker’s jacket, stylish brocade dinner jacket, as well as pin tucked and moulded lapels and shoulder detailing offered the western wear options. The Indian option came in the form of a long regal sherwani with a hint of glitter that will prove ideal wedding wear. Ending the show was the very versatile and multi-talented Bollywood personality, Karan Johar who strutted in an ornate rose coloured one-button jacket with black lapels, corded epaulets and teamed with sleek black trousers. 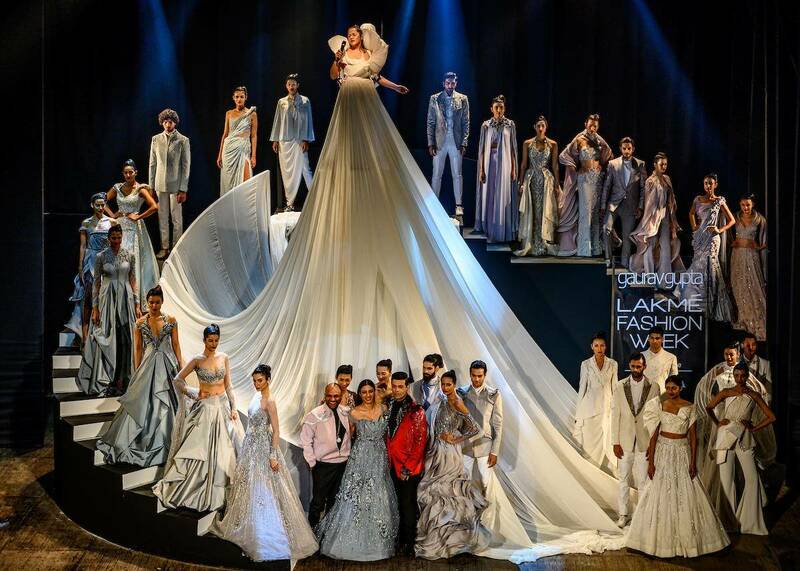 The “Unfolding” by Gaurav Gupta was not only a dramatic visual fashion presentation but also a truly grand opening for the Lakmé Fashion Week Summer/Resort 2019 edition.